To purchase this as a trampoline and enclosure combo, click here. Although our prices include shipping charges, due to the fluctuation of fuel charges, the shipping price may increase depending on your location. If so, we will call you with an adjusted price. On Some Occasions Some Delivery Points For Our Larger Trampolines May Not Be Able To Be Reached By Our Carrier. We Will Call You To Find Out The Best Delivery Point For You & We Will Always Try To Find The Best Route Possible For Your Product. 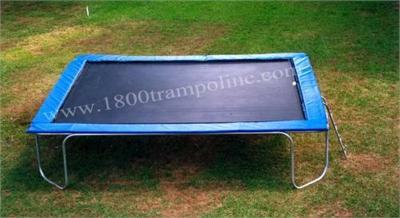 Try out the 15' X 17' Extreme Rectangle Trampoline. With more space, it is easier to keep a safe distance away from the edges while having fun. Trampolines allow user to stretch their legs and get much needed exercise to keep their body healthy. Rectangular trampolines can also be great for practicing gymnastics. • Frame: 15'x17' with 11 gauge continual flow galvanized steel construction of TUF 40 pipe assures a long, maintenance-free life. Height: 42" with 4 corner legs for extra stability. • Jumping Mat: 12'x14' non-abrasive #1 grade permatron trampoline material with a bursting strength of 775 lbs/sq. in. Tough 1 1/2" wide straps sewn with triple uv-coated, weather resista nt thread. • Guarantee: 5 years on mat material, 2 years on mat stitching. • Frame Pads: Deluxe 2" thick, 12" wide, polyethylene foam covered in heavy, 18oz. weather-resistant vinyl on both sides which makes the pads reversible for "Twice the life." 2 year warranty.